So, what else do you do in Athens besides eating and making day trips to nearby islands? 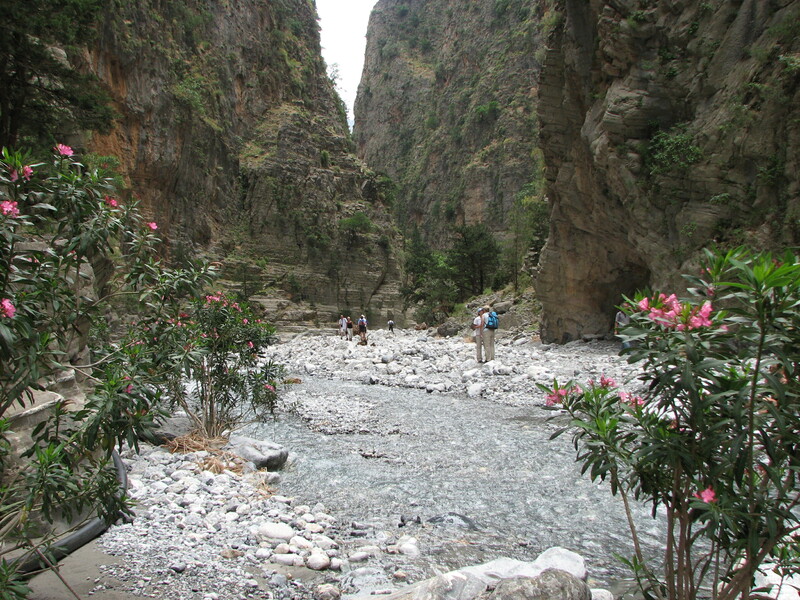 Well, for starters, there are museums and archeological sites galore. 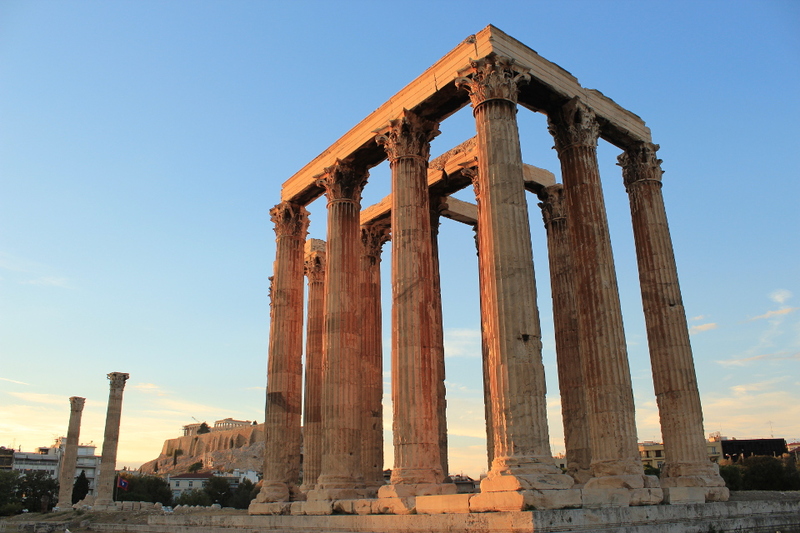 Athens is one of the world’s oldest cities, with a recorded history spanning around 3400 years. Any public work involving digging is often interrupted because antiquities are unearthed. I am not very big on museums, so I decided to explore the archeological sites instead. 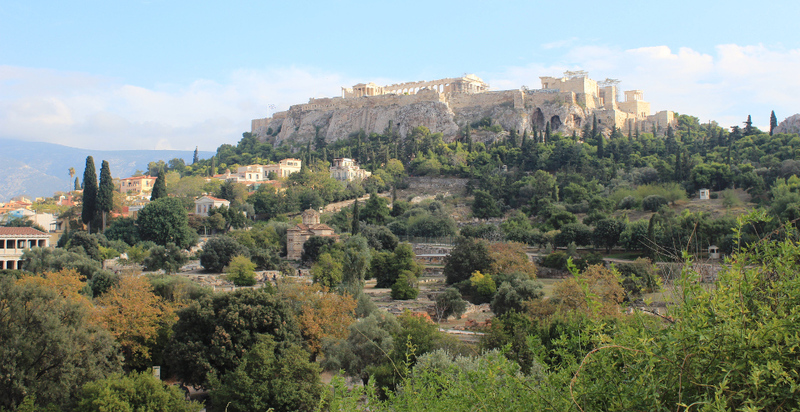 The main attraction that everybody sees is, of course, the Acropolis. 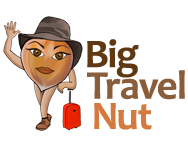 The 12 € ticket (valid for 4 days) also gives you access to the following sites: Ancient Agora and Temple of Hephaistos as well as Ancient Agora Museum, Dionysus Theatre, Hadrian’s Library, Temple of Olympian Zeus, Roman Agora, and Keramikos (ancient cemetery) along with its museum. So it’s really quite a good deal. 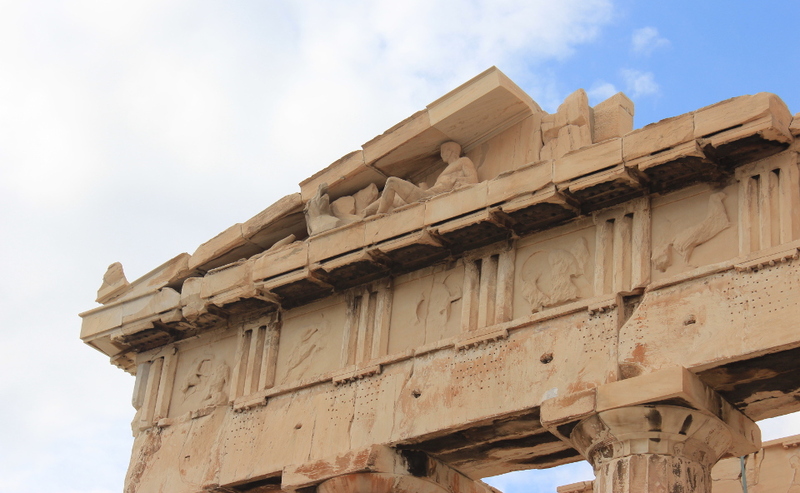 If you visit one of the minor sites first, make sure that you get the combined ticket (assuming that you will be visiting the Acropolis later). These sites are around 2000-2500 years old, so there isn’t all that much left. 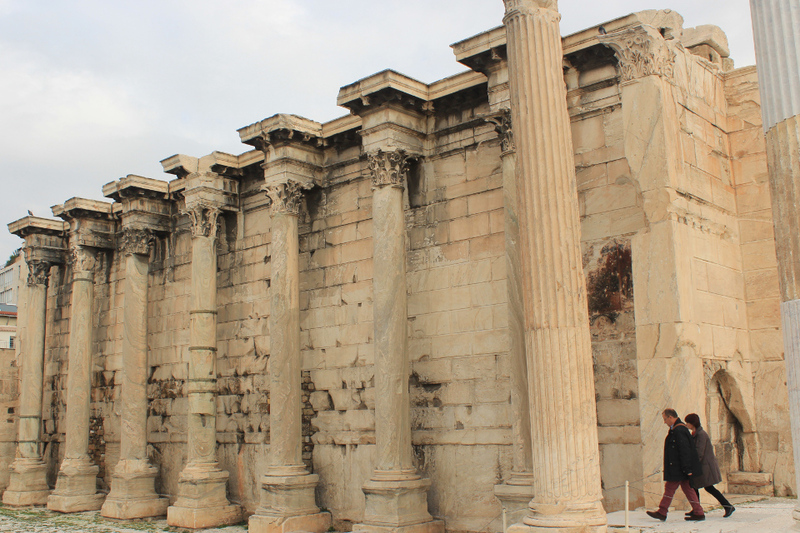 But I love Greek and Roman ruins, even if it’s just a cluster of ionic columns jutting to the sky. There is such an elegance, refinement and pleasant symmetry to that architecture. When I wander the sites, I try to imagine Greek philosophers lecturing, or ancient Romans reclining on marble slabs while eating grapes! 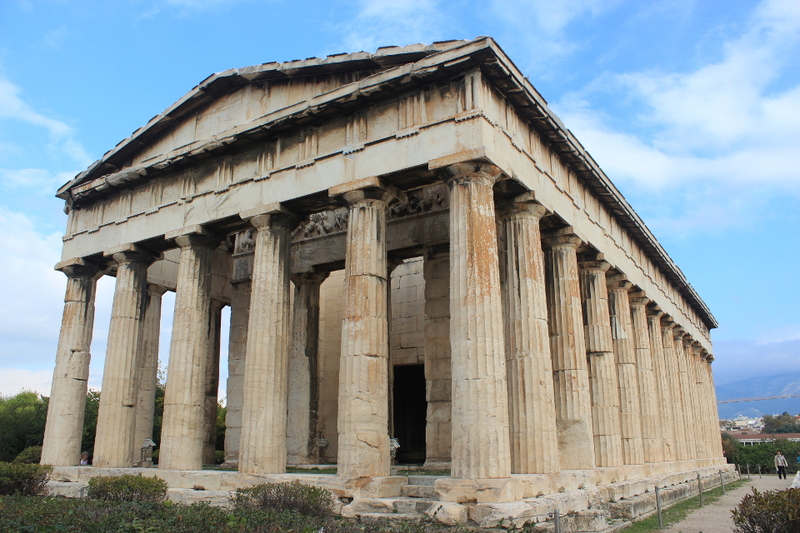 The Parthenon, the main building of the Acropolis, is the exception. Although it’s in a state of constant restoration, with cranes and scaffolding jutting out of it, there is enough left that you can fully appreciate its size and symmetry. Of course it has suffered many indignities over the years, including the theft of some of its sculpted frieze, and a huge explosion in 1687 that blew up the central portion. 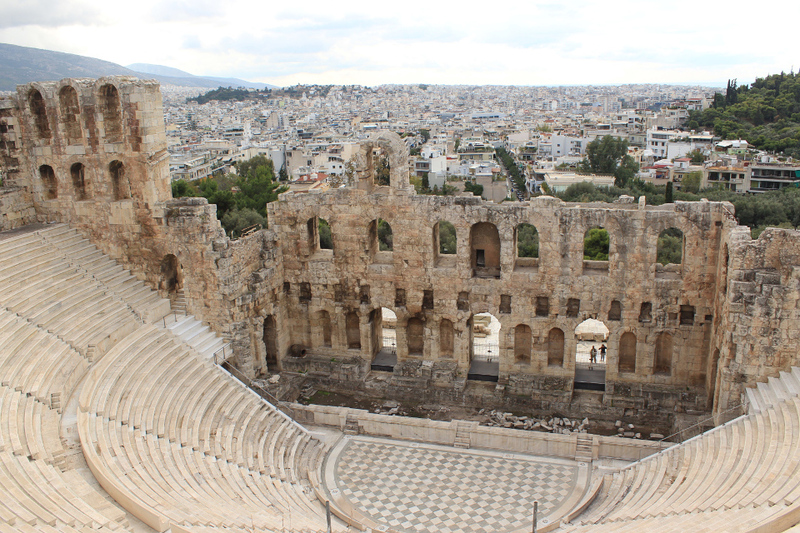 Near the Acropolis are the Odeon of Herodes Atticus (amphitheatre) that you can see from above but not enter, and a smaller temple called the Erechtheion with some nicely preserved columns and statues. 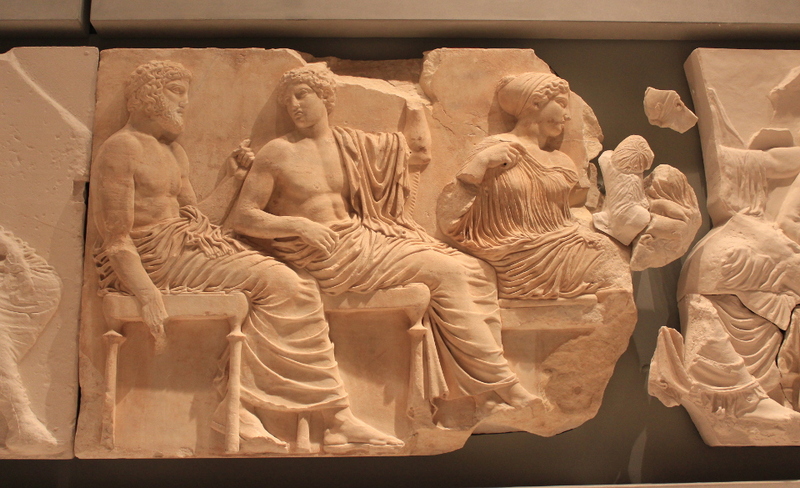 Many of the sculptures and other art from the Acropolis are contained in the new Acropolis Museum, opened in 2009 and located down below. The admission costs only €5 and is not included in the combined ticket. 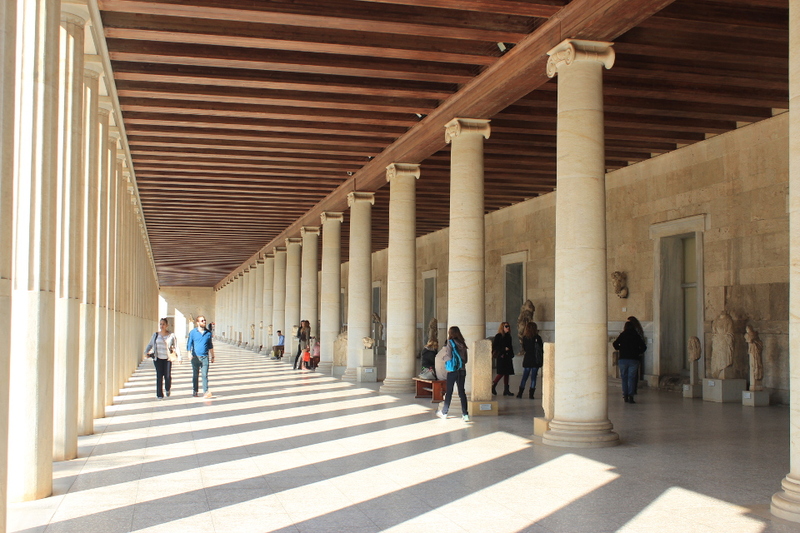 This museum replaces a much smaller one that used to be located next to the Parthenon. This is the only museum I visited on this trip. Unfortunately you are not allowed to take photographs within a large part of it. On the second floor is a café that affords clear views of the Acropolis on its rocky pedestal. 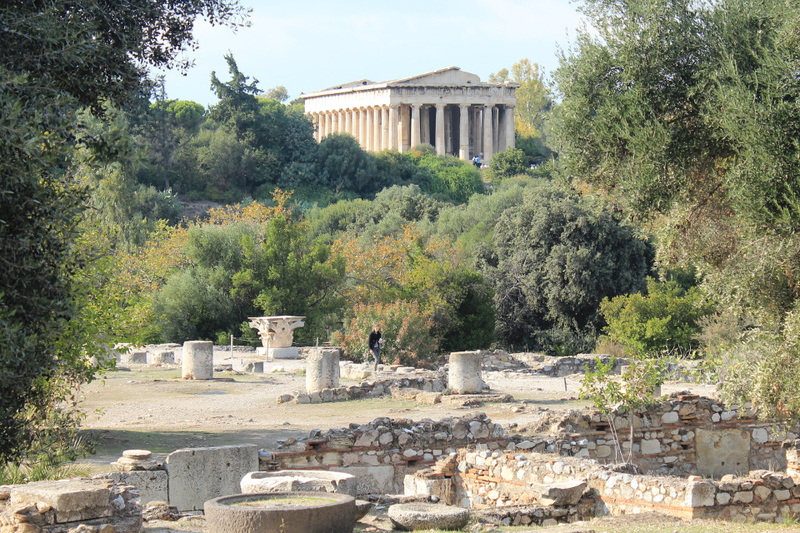 Another spot that has particularly lovely views of the Acropolis is the Temple of Hephaistos, which looks like a mini Parthenon and is located in one corner of the Ancient Agora site. 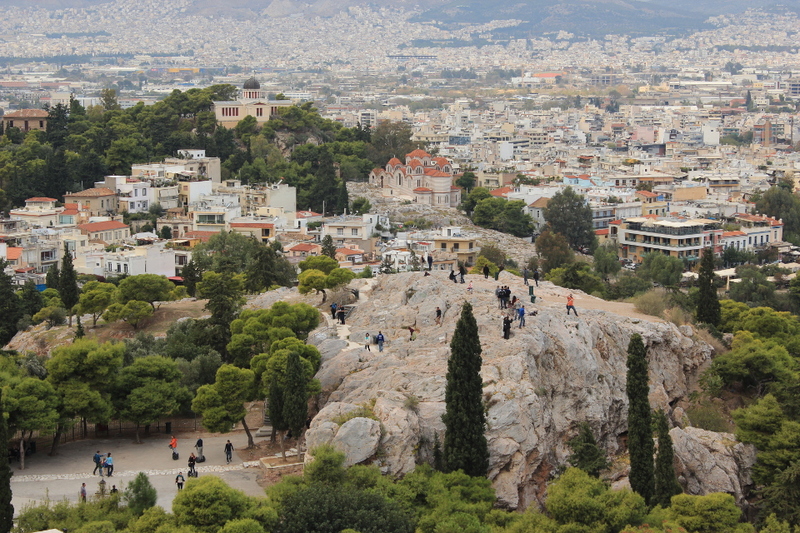 And of course the Acropolis itself is the spot to get phenomenal views all over Athens. Make sure that you walk all the way to the observation belvedere at the very back near the flag. The entrance also provides a great view. Just remember to turn around (or wait until you exit). 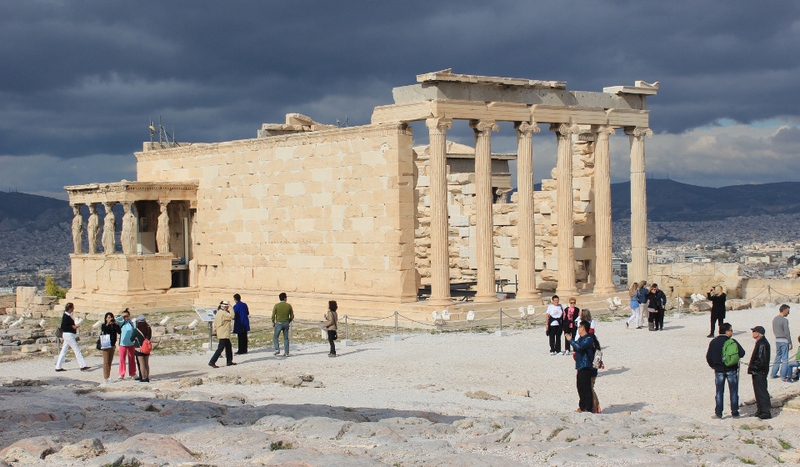 Every traveller and every tour bus stops by the Acropolis, so expect a lot of people. Fortunately it is an outdoor site, so you’re not really stepping on each others’ feet. If you want your pictures to be relatively free of people, you may want to arrive first thing in the morning when the site opens. Failing that, you could try lunch time (around 1 or 2 pm), or at the very end of the day, before closing. 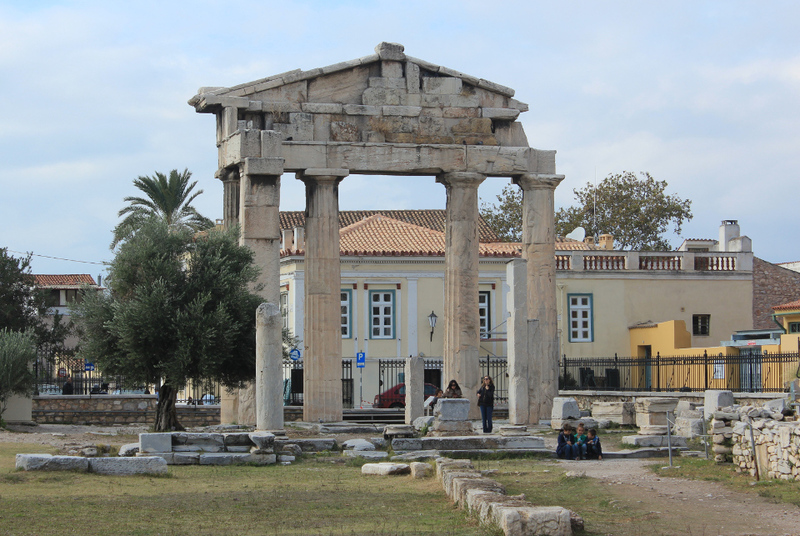 The funny thing about central Athens is that just by wandering its modern streets and boulevards, you unexpectedly come upon some of these ruins when you round a corner, or cross a street. And suddenly, it’s right there! And if you look up from the uneven sidewalks, there is a good chance you’ll see the Acropolis itself. It’s indeed quite crowded, but still worth to go. 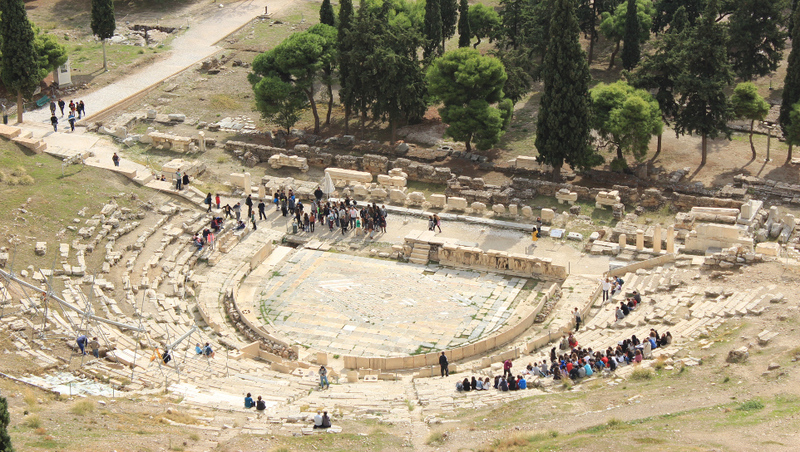 The ticket also comes packaged with Ancient Agora (it’s like Acropolis without the crowd) and Kerameikos (very underrated archaeological site focused on death and cemeteries). 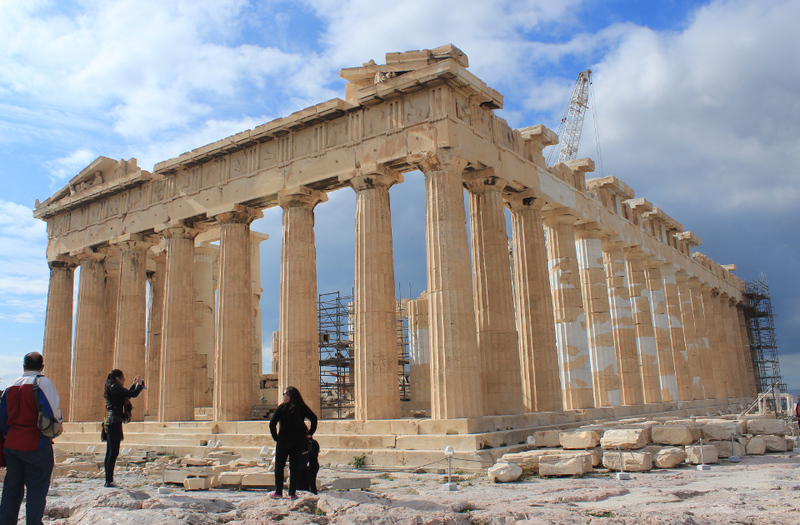 I was very lucky, I arrived pretty late to the Acropolis and it wasn´t crowded at all. 5 min. in line and I was in. However my favourite in Athens was the neighbourhood Anafiotika.